Mr. Sharma’s family was left bereaved when Mr. Sharma lost his life in a fatal accident. The emotional loss incurred was unsurmountable but the family was tension-free when it came to the underlying financial loss. Mr. Sharma was the sole bread-winner of the family and was also wise in making financial decisions. He invested in a term insurance plan when he was alive and this insurance plan came to his family’s rescue when Mr. Sharma died. The plan paid a lump sum benefit to Mr. Sharma’s wife and even though she grieved her emotional loss, she was financially secured. A dire financial crisis was averted and the family was financially provided for. A nice story, but did you grasp the crux? It was a term insurance plan which played the hero and saved the day for the family in financial sense. Though the loss of an individual cannot be compensated, the insurance plan aptly compensated for the financial loss which accrued when the bread-winner died. Does your story too have a term plan hero? Or is the unawareness villain writing a tragic end to your story? A term insurance plan is a plan of insurance which is taken for a specified period. During this period, called the plan term, if the person whose life is insured dies, the sum assured is paid. The sum assured is the amount of cover which is chosen at the time of buying the policy. The benefit under the plan is payable only if the person insured dies. If the plan completes the stipulated term and the person insured is alive, the plan matures. On maturity, no benefit is paid as the insured is alive. So, this is a pure protection insurance plan which provides coverage against the risk of death. Any other risk, like surviving till maturity, is not undertaken and no benefits are paid in case of such risks which are excluded. – the maximum amount of sum assured which can be opted under a term insurance plan is limitless. If you qualify under the underwriting norms of the company, you can avail very high levels of sum assured. So, whether you want coverage of Rs.50 lakhs, Rs.1 crore or Rs.5 crore, a term plan would allow you this coverage. It determines the corpus required for meeting your family’s lifestyle expenses and therefore you should choose the sum assured very carefully. There would be no maximum limit curtailing your choice subject to your financial underwriting. – if you are afraid of choosing a higher level of sum assured in the fear of the associated unaffordable premium incidence, relax! A term insurance plan is the cheapest form of insurance available in the market today. Against the high levels of Sum Assured available, the premiums charged are extremely low and are easily affordable. No other plan of insurance promises such high levels of coverage at such low rates of premiums. Despite the above mentioned benefits, the policyholder faces a dilemma when he or she considers investing in a term insurance plan. Since term insurance plans only promise a death benefit, the lack of any return on plan maturity is a common dilemma. This, coupled with unawareness of the term plan’s importance, is the main reason why term insurance plans are given a miss by many of us. While the lack of maturity benefit cannot be contested, term plans are very important in the context of the coverage provided. As the plans charge low premiums for higher coverage levels, the common man can easily fulfil his protection needs. Given today’s rate of inflation, the lifestyle expenses are rising progressively. In such a scenario, in the absence of the earning member, a substantial corpus is required to meet such lifestyle expenses of the family. Such a substantial corpus cannot be self-built by a common middle-class individual and a term insurance plan finds application in these cases. By providing the promise of a lump sum corpus contingent on death, the plan takes care of the family’s financial stability in the absence of the bread-winner. Since the premiums are minimal, the plan can be considered as an investment for buying peace of mind regarding future financial security, isn’t it? For those of you who are still unconvinced and want a return out of your term insurance plan, there is a solution for you too. Insurance companies, gauging people’s reluctance in buying the plan, have launched return of premium term plans which promise a maturity benefit. Happy, aren’t you? Let’s understand the plan and also other variants of a term insurance plan properly. – these are the plans which we have been discussing since starting of this topic. These plans provide only death benefit when the insured dies within the chosen term of the plan. In case of survival till plan maturity nothing is paid. – as the name suggests, these plans go one step further than pure term plans. The premiums paid during the plan tenure are returned back to the policyholder in case the plan matures. Therefore, those looking for term plans which provide a maturity benefit can opt for these plans. The death benefit is similar as in case of pure term plans. – under these plans, the Sum Assured chosen at the commencement of the plan increases every year throughout the plan tenure. The rate of such increment is determined by the insurance company and is mentioned before-hand. The premiums remain same throughout the term even though the coverage increases. On death, the increased coverage at the time of death is paid. However, the plan has no maturity benefit. – opposite of increasing term plans, decreasing term plans decrease the Sum Assured every year by a fixed percentage. This rate is also pre-fixed. On death, the sum assured in the year of death is paid. On maturity, usually, the sum assured reduces down to zero and no maturity benefit is payable. These plans find application with loans issued by banks and financial institutions. The sum assured reflects the loan amount and the reduction usually reflects the EMI paid. The reduced sum assured reflects the outstanding balance of loan and the plan is issued with the objective of repaying the outstanding loan balance if the insured dies prematurely. – term plans are traditional insurance plans which are not linked to market returns and they provide a fixed benefit. – since these plans are designed for protection purposes, the tenure offered under these plans is usually long. A maximum of 30 or 35 years can be opted as the coverage term under term plans. 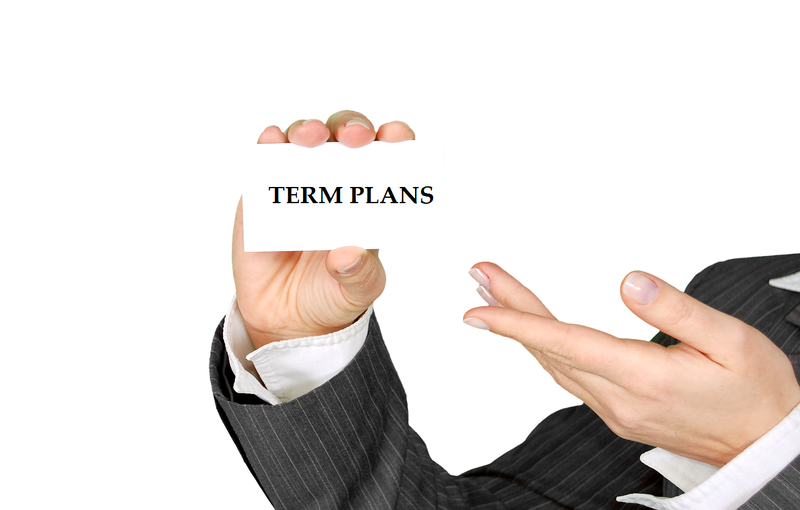 – term plans pay a lump sum benefit in case of death (or maturity in case of return of premium plans). However, insurers have also launched monthly income term plans wherein the death benefit is paid in monthly instalments post death for a specified tenure. These plans aim to provide regular monthly incomes to the insured’s family for meeting their day-to-day expenses instead of a lump sum corpus. The plans also provide the nominee the option to withdraw the monthly benefits in lump sum. However, in this case, the lump sum amount paid would be the discounted value of the aggregate monthly benefits. – since time immemorial, term plans are sold by insurance agents or brokers and the channel is still available today. However, insurers are also offering direct online plans which eliminate middle men (agents or brokers). These term plans can be bought through the website of the insurance company or any other web aggregator. Since middle men are eliminated, the premiums are lower. The purchase is done online and the premium payment is also done online. So, now you know the meaning and the different types of term plan available in the market today. Hope you also understood the importance of such plans. Term insurance plans are a quintessential part of your financial planning process and you should be wise just as Mr. Sharma was. So, insure yourself today and buy peace of mind for your family.